Everyone in the house is completely in the holiday mood now. The school break will start on Thursday and hubby will be off from the office tomorrow afternoon. Some of the friends who celebrate Idul Fitri have go back to their hometown for family gathering. Usually Jakarta will be a bit quite and no traffic jam during this time... woohoo! Something that I am looking forward to. We don't have any plan to leave the town for the holiday. So we will just have fun with friends and family. Sadly, kids will have their mid-test right after the school break ... so I think they will need to review their lessons too during the school break. Today's bento was inspired by a pack of new chopsticks that I bought from Daiso yesterday. Little green doggies were made of edamame mixed rice. I will put the tutorial on how to made them during the school break when I don't have any bento to make. I used food picks for the ears, easy and quick. I remember reading one book in Kinokuniya bookstore long time ago with this dog had a leaf shaped ears but I can't recall the name of the character. Inside the box : steamed egg tofu with garlic oil, stir fry carrots & snow peas, grape tomatoes, and lemongrass stir fry pork. I miss the feeling of eid, but eid is not the same anymore since 9 years ago. Btw, very healthy choice with edamame. Omg, SO cute! I wanna make edamame doggies!! Love this one so so much Lia! @Indonesia Eats : Thanks a lot Pep! Why is that so different feeling after 9 years? Is that after you moved to Canada? Oh soooooooooooooooo cute green doggies! Hope you'll have fun with the family this weekend! @prince n princess mum : Thanks a lot dear! Wishing you a great holiday too! PS. Very cute doggies and very clever idea of using picks as ears! Wuaaaa.... IJOOOOOOOO!!!! 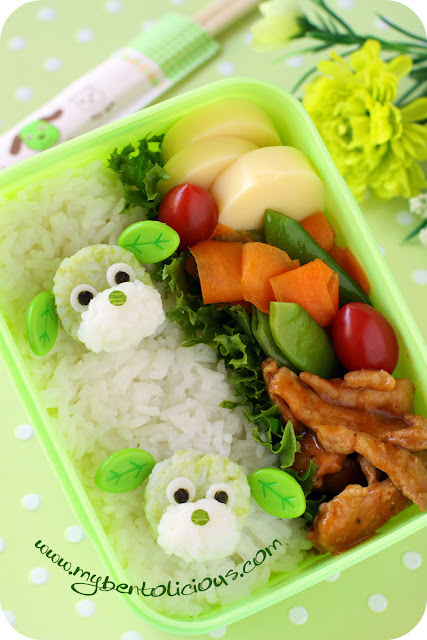 Heuheuheuheu love love love this bento A LOT :D. I'm gonna copy this, copy copy copy copy copy *tunggu tanggal mainnya sambil nunggu tips dari Mbak Lia heheheh*. I've ever seen these leaf-eared doggies, ya but forget the name too :D.
@tatabonita : I know your favorite color, right? Because everyone will be in the house, so easier for me to find hand model later to help ... hihihi :) Thanks Tata! Aw, those doggys are sooooo cute! Your little green doggies are so cute! The pastel colours are so soft - it makes me think these must be little plush toys, not food! adorable, congrats! @Bento Box / Asfora : Thanks a lot Asfora! This doggies are so adorable, but I thought it's sheep at first sight. I like the idea of using picks as the ear. Nice!! @Vanessa : hehehe ... Thanks a lot Vanessa! Aw, love the cute green doggies with leave ears! I'm looking forward for the holidays too over here, though is not as long as yours! Hey Lia, I really don't know how to express my words for your lovely bentos. They are all so cute and pretty! I'm with Anncoo--your bentos leave me speechless with delight and admiration, Lia! Beautiful nature pups bento, bravo! Adorable and so smart to use the leaf picks as ears.. genius! Hi lia , super cute dog! Love the green shade. I can't wait to see your tutorial! Those doggies are soooo cute. Hey Lia, OMygosh! I missed out so much good bento posts! I love these doggies edamame ears, sooo original! I've never seen or tasted egg tofu. I also love the colour of the bento box.. What a pretty setup! Enjoy your holidays! Hope you have a wonderful time! @OhayoBento : Thanks a lot for your comment! these little doggies are so cute, woof woof! i love the leaf-ears, wonder what character has those. aww the dogs are so cute! I love the ears! Happy holidays! Love the little cute doggies...!! I got to know your blog from your guest post at Pig Pig's... I just have to compliment you on your sweet looking blog. Love all the cartoon caricatures - so homely and of course your bentos are amazing... Your family is so lucky! Aw, such cute puppies - love their ears! Hope you enjoy your holiday. I think that doggies's name is *Ocha-ken* (tea dog). Your ochakens are insanely cute and well-duplicated. I hope your family all have a lovely holiday!! @babykins : Thanks a lot Izumi! Yes, the name is Ocha Ken ... A lot more in the series, all so cute! way cute!! and really healthy diet too!